Donnie Trumplestiltskin reportedly has said he has ordered the Federal Emergency Management Agency (FEMA) to withhold funding for California unless the state improves its forest management to prevent wildfires. For more on this see Trump tells FEMA not to send more money to California for forest fires. I do not know, or care, if there is any truth to his claims that forest mismanagement is the cause of the forest fires. For the sake of argument, lets assume that forest mismanagement is in fact the cause of the forest fires and consider who is to blame. According to California Forests, the following individuals own the approximately 33 million acres of forest land in California. 57% Federal agencies (including the USDA Forest Service and USDI Bureau of Land Management and National Park Service). 40% Families, Native American tribes, or companies. 3% State and local agencies including CalFire, local open space, park and water districts and land trusts. In other words, the Federal Government owns most of the forest land in California! Therefore, if the forest fires are the result of mismanagement, it is the Federal Government’s fault. So, Donnie Trumplestiltskin is threatening to punish a state for the actions of the Federal Government! All hail Donald Trump; a.k.a. Donald Drumpf, a.k.a. Lord Dampnut, a.k.a. Dumbnut, a.k.a. 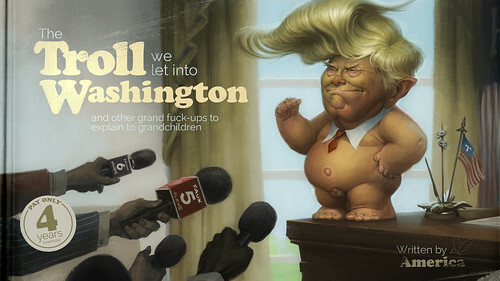 Donnie Trumpelstiltskin, a.k.a. Donald tRUMP; our most, or perhaps least, honored (not my) POTUS and our great Bloviator in Chief!